If you’ve ever worked with children, you must know very well that flexibility is key. You’ve discovered that the lesson plans you’ve worked so hard on preparing are nearly obsolete in the presence of children. Through the years I have learned that no matter how meticulous I am in my planning, my lesson plans only serve as a mere skeleton. The vibrance and personalities of the children animate the teachings and bring everything to life. Last summer, I taught a yoga camp in Baltimore to a small group of girls of ages 6-10. I had prepared an art project to go along with our yoga class on this particularly dreary and drizzly day. I had picked up a bouquet of colorful flowers from the market and planned on making a mandala out of the petals and leaves as a class. My intention was to teach them about community and how by working together we could make something beautiful. I knew it would be a great way to help focus their minds to prepare them for meditation. I hadn’t thought much about addressing the idea of impermanence with these girls but they had another agenda. When I introduced the project I told them we were going to break up all the flowers and leaves, place them in separate piles and then construct the mandala. Their gasps were astonishing, it was as if their pet goldfish died. They exclaimed, “We can’t rip the flowers apart, that is killing them!” So I explained that once the flowers are plucked from the ground, we take them away from the earth. Those lonely flowers were just sitting on a shelf and if we didn’t purchase them, they could have died right there in the store. When I bought the flowers for them, we gave them a second chance at life by simply appreciating their beauty, I described. I likened our project to recycling, explaining how we were going to repurpose something that is already beautiful into something magnificent and infused with intention. Their faces softened but I could still sense their apprehension around deconstructing the flowers. I used that opportunity to ask them, what would make them feel better in this situation? After a few shrugged shoulders and just plain defiance, I offered to say a prayer for the flowers to thank them for allowing us to use them for art. The girls agreed and we did just that. A few moments into making the mandala, a little girl asked how she was going to take the project home. When I told them they weren’t going to take anything home, the wave of emotion swept over the room. You could see tiny little egos, their own sense of identity, rattled to the core. “But its mine and that means I’ll have nothing to show my parents,” someone replied. The girls got a taste of what it was like to work together without expectation or attachment to the fruits of their labor, it was selfless service. To have something to compare it to, I let them watch how Tibetan Monks create sand mandalas, then just brush them away and let go of their hard work. We then talked about what letting go means and how life is a series of letting go. I asked if they had ever moved, or perhaps the feeling they get when they change grades and their friends are in the other class, or when you loose a pet. They began to identify ways in which they “let go” and took it on as a badge of courage. We let go all of the time and we don’t even realize we’re doing it, but it’s part of human nature just to adapt. Finally, the mandala was complete and they all took time to look at it in awe to honor what they created. I had thought they came to peace with the idea of impermanence, but then they asked where the flowers were going to end up after we sweep away the mandala. Without thinking, I just responded, “the trash,” and it was as if their little hearts couldn’t take it anymore. Again, the anguish on their faces was unbearable, so I asked, “What would you prefer to do with the petals?” They wanted to take the flower petals and bring them outside to give them back to the earth. So we trekked in our rain boots and pink umbrellas into the back woods of the school. There was a bridge that crossed over a little creek. 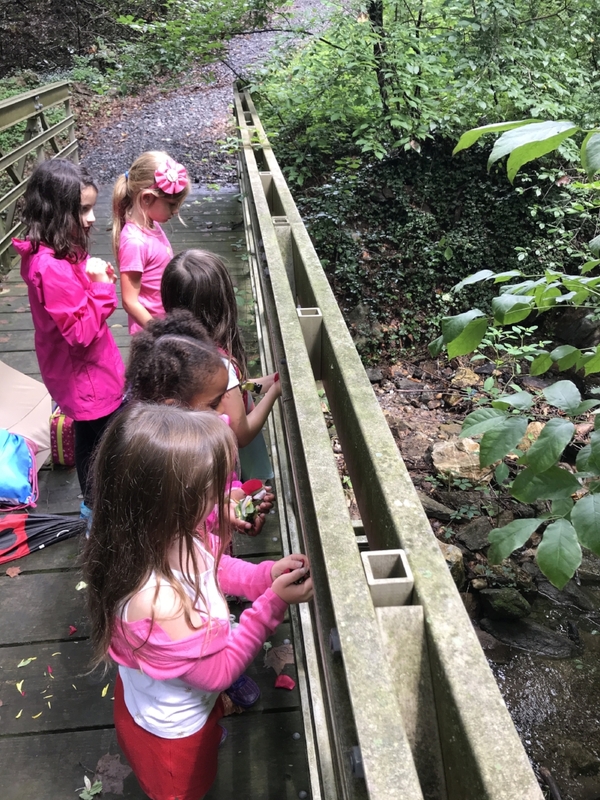 The girls each took a handful of petals, set an intention, tossed them off the bridge and watched them float down the stream. One little girl prayed for her great grandmother she had never met and one little girl wished for “family business.” As we walked out of the woods, after getting eaten alive by mosquitos, we all walked out with a sense of peace. For some of the girls, they were fixated on the concept that this project was all about death and rituals that people do at funerals. In the back of my mind, I sort of agreed with them. Mandalas represent how temporary life is, how we build our lives to our own design and then one day we let go of all we have worked on. It is the most humbling moment as a teacher to try to explain such HUGE life concepts to children. It requires you to redefine how you connect to the world and what you believe to be true, it forces you to understand and articulate your beliefs in a simple yet concrete way. No lesson plan in the world could have prepared me for the way things went that day, but that is why working with kids is such a blessing. Just as flowers reach their fullest potential as they blossom into beauty, children, as well as adults, have the same capacity to expand and evolve if their environment is supportive of their growth. It is my duty as a teacher to tend to that garden with love and care and to create a space where the hearts and minds of children can bloom into their radiance. Namaste! My name is Viki DeSalvo. I am bountiful, beautiful and blessed to be sharing my heart with you all. I have been a yoga teacher for adults and children for 7 years and have been writing and journaling for as long as I can remember. Writing for Let’s Imagine has granted me the opportunity to meld all of my passions and gifts together. This is an avenue where I can channel what I know and what I love. I am honored to be a part of this community and to bring the world content on the power of yoga, art and earth based practices for the development of youth. Thank you for reading! Spread the Holiday Cheer - Volunteer with us in 2019!